These fallen soldiers will march on in perfect ranks for infinity. 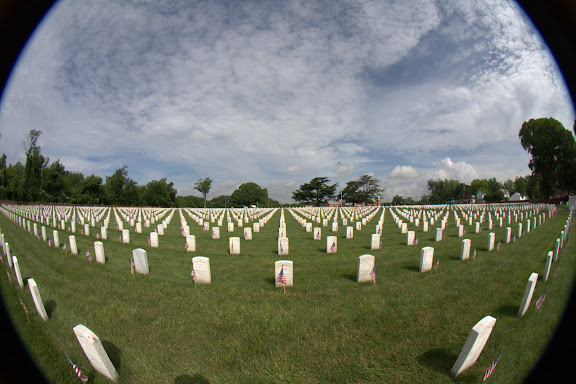 The Hampton National Cemetery, Phoebus Annex on the day after Memorial Day. Some of the 28,000+ flags still fluttering in the early morning breeze pay tribute to the memory of those who served our country. This section dates from the early 20th century and contains many Civil War veterans who died at the Hampton Old Soldiers Home - now the Hampton V.A. Hospital. Note the designation U.S.C.T. on Alvin Went's marker in this photo link. There are thousands of these markers at Hampton. Post a comment if you know what it stands for. Canon 40D, 8mm fish eye lens, 1/1600 sec @ f/8.0, ISO 200. Does it stand for United States Colored Troops?